M. R. Hassani, E. Mahmoudinezhad Zirdehi, K. Krok, P. Schall, M. Fuchs, F. Varnik. The correlation amplitude versus time at temperatures of T=0.7 (supercooled liquid state) and T=0.2 (glass). The dashed lines give theoretical predictions within generalized hydrodynamics (GH) for two different cases. 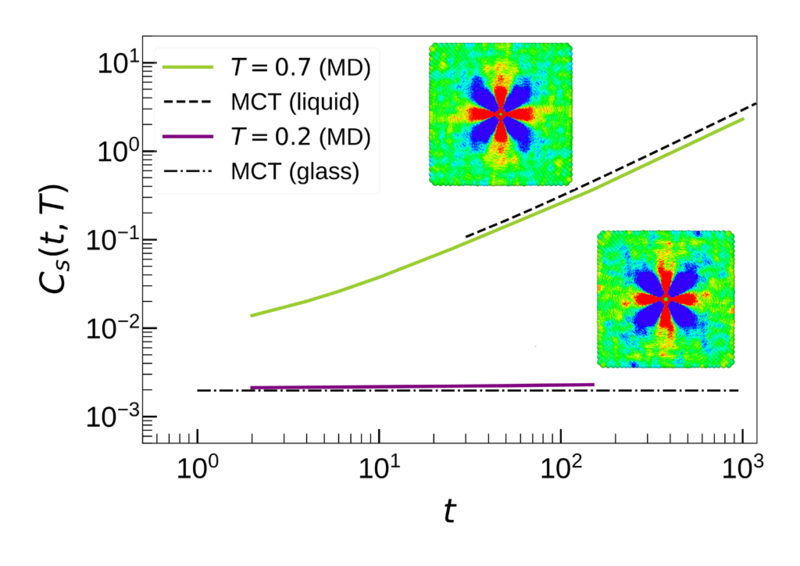 The color scale plots show the correlation function at respective temperatures, highlighting the four-fold symmetry both in the glassy state and in the supercooled liquid. Recent two-dimensional computer simulations and experiments indicate that even supercooled liquids exhibit long-lived, long-range strain correlations expected only in solids. Here we investigate this issue in three dimensions via Newtonian molecular-dynamics simulations, by a generalized hydrodynamics approach, and by experiments on Brownian hard-sphere colloids. Both in the glassy state and in liquid regimes, strain correlations are predicted to decay with a 1/r3 power law, reminiscent of elastic fields around an inclusion. In contrast, the temporal evolution of the correlation amplitude is distinct in the liquid state, where it grows linearly with time, and in the glass, where it reaches a time-independent plateau. These predictions are assessed via molecular-dynamics simulations and experiments. In simple liquids, the size of the cooperative strain patterns is of the order of the distance traveled by (high-frequency) transverse sound prior to structural relaxation. This length is of the order of nanometers in a normal liquid and grows to macroscale upon approaching the glass transition.